Antarctica: Still No Time to Sell the Beach House? With the COP 21 climate treaty conference in Paris only weeks away, federal agencies are trying harder than ever to spook the public about the so-called climate crisis. This can be tricky when an agency-funded study indicates the state of the climate is better, rather than worse, than they thought. This good news conflicts not only with the IPCC’s conclusion but also with a study published in June 2014 widely hailed at the time as additional proof of the climate crisis (even though it estimated that Antarctica’s rate of ice mass loss translated into only about 1.7 inches of sea-level rise per century). 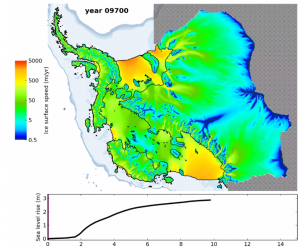 So how does Zwally assess the significance of his team’s finding that Antarctica is currently gaining ice mass and reducing sea-level rise by 0.23 mm/year, or about 0.9 inches per century? He says the “good news” is also “bad news.” How so? “If the 0.27 millimeters per year of sea level rise attributed to Antarctica in the IPCC report is not really coming from Antarctica, there must be some other contribution to sea level rise that is not accounted for.” OMG! The IPCC does not know where one-hundredth of an inch (0.27 mm) of annual sea-level rise is coming from. (1) Can anyone reliably measure global sea-level rise to one-hundredth of an inch? Answer: No. According to the University of Colorado Sea Level Research Group, the margin of error in satellite measurements of global sea level is 0.4 mm/year. That is larger than the alleged increment of sea-level rise for which the mighty IPCC cannot account. (2) So is it possible the IPCC simply overestimated global-level rise by one-hundredth of an inch and there’s no missing increment to be accounted for? Answer: Yes. So things are better than the Zwally team expected but that’s all the more reason to bet on their prediction things will be worse in 20 or 30 years. Some perspective here would be useful. Sea levels rose about 8 inches in the 20th century. Whether Antarctica adds another 1.7 inches to sea-level rise in the 21st century, reduces it by 0.9 inches, or produces something in between, there is no reason to believe the end is nigh. Let’s cut to the chase. 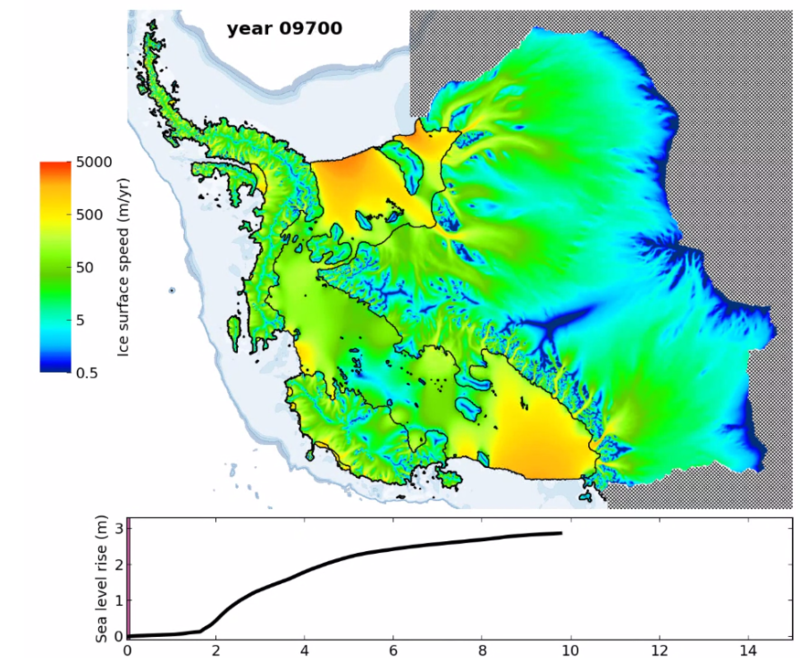 Once destabilization begins, how long would it take for the WAIS to shed all its ice and raise sea levels by 3 meters? The authors suggest “centuries to millennia.” The PNAS press release includes a video illustrating how the ice sheet dynamics in the researchers’ model play out. As Anthony Watts notes, in the scientists’ model run, the WAIS disintegrates over a period of 9,700 years! Click here here to watch the video. The graphics are quite cool — but don’t get spooked! As explained in a previous post, scientists have known for some time that the WAIS is doomed. For example, Conway et al. 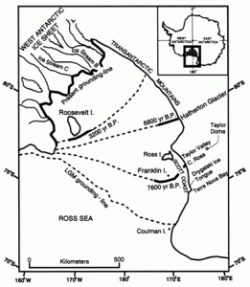 (1999), a study published in Science, found that the grounding line (sea-floor boundary) of the Ross Ice Shelf (the largest ice shelf in Antarctica) has retreated about 1,300 kilometers since the last glacial maximum. Most of the recession “occurred in the middle to late Holocene [3,000-9,000 years ago] in the absence of substantial sea level or climate forcing.” See the picture at the top right of this post. The Conway team speculated that complete disintegration of the WAIS “will take about 7,000 years.” That’s in the same remote futuristic ballpark as the PNAS study. The new JOG and PNAS studies don’t change the bottom line. Now is not a good time to sell the beach house. It’s never a good time to abandon affordable energy.